This page shows you how to use ASP.NET Core Diagnostics. ASP.NET Core module is not installed. ASP.NET Core module version does not match the minimal version required by the web apps. Visual C++ 2015 runtime is not installed. Handler setting in web.config is invalid. A thorough diagnostics tool can reveal typical configuration mistakes and help resolve them. Minimal ASP.NET Core module version required can be found in articles like this. 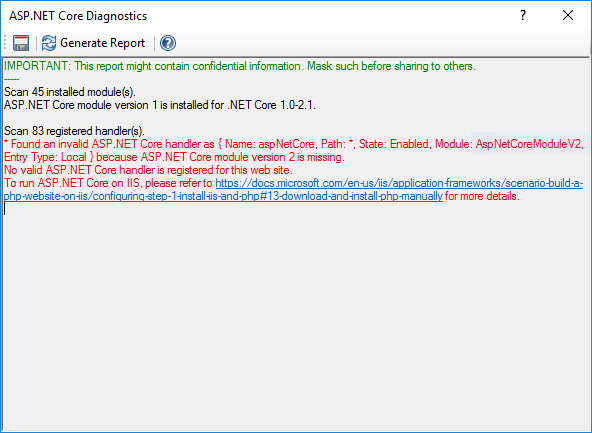 For web sites opened in Jexus Manager, there is an action called ASP.NET Core Diagnostics showed. A report is generated when “Generate Report” button is clicked. ASP.NET Core module on IIS. Application pool (No Managed Code).